President says his administration is putting an end to the 'war on coal'. 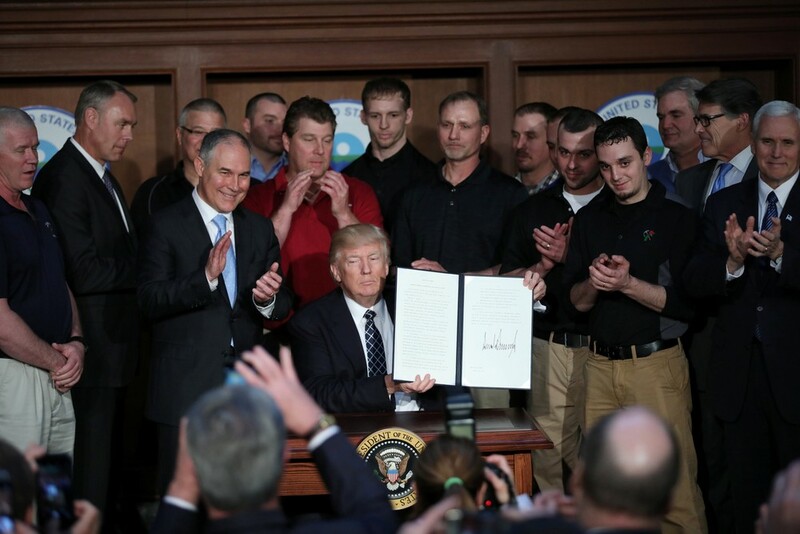 US President Donald Trump on Tuesday signed a decree repealing a series of climate change regulations adopted by his predecessor, Barack Obama, a measure designed to strengthen domestic energy generation and create jobs . Environmentalists say the decree is dangerous and has promised to fight it in court. Before signing the decree on a visit to the Environmental Protection Agency (EPA), Trump said his administration is putting an end to the "war on coal". He also said that federal government regulations are "killing jobs". "We have a very impressive group here to celebrate the beginning of a new era of energy, production and job creation in America," he said. The main target of the decree is Obama's Clean Energy Plan, which requires states to eliminate carbon emissions from power plants - a critical element in helping the US meet its commitments to a global climate agreement signed by nearly 200 Countries in Paris in December 2015. The decree will also rescind a ban on coal mining on federal lands, reverse rules for containment of methane gas emissions from gas and oil production, and reduce the weight of climate change in federal assessments of new regulations. Trump has been pointing to changes for some time now, saying that reversing ecological regulation will leverage gas, oil and coal production and generate thousands of jobs, all without damaging the country's air and water quality. Comprehensive, the decree is the boldest of Trump's broader initiative to reduce environmental regulation to resurrect the drilling and mining industries, a promise he reiterated during the presidential campaign. Energy analysts and executives questioned whether the measures will have a major effect on their industries, and environmentalists have dismissed them as negligent. "I can not tell you how many jobs the presidential decree will create, but I can tell you that it provides confidence in this government's commitment to the coal industry," Kentucky Coalition President Tyler White told Reuters. .
"These actions are an assault on American values ​​and threaten the health, safety and prosperity of every American," said billionaire environmental activist Tom Steyer, director of the NextGen Climate group.